Picturing Disney: Have a Beary Magical Weekend with Disney & Build-A-Bear! 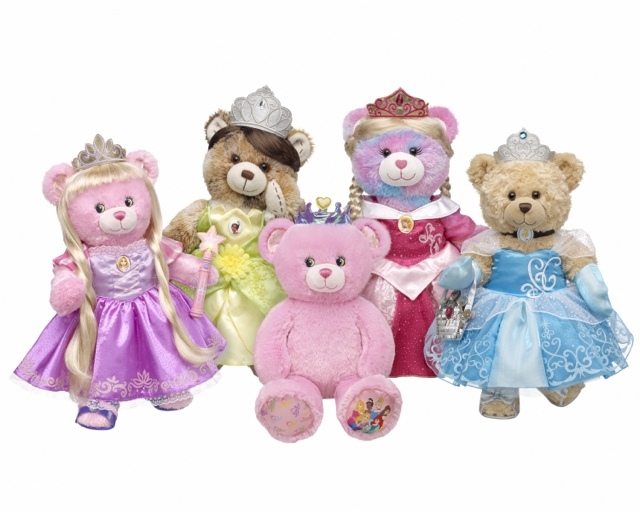 Have a Beary Magical Weekend with Disney & Build-A-Bear! Great news for everyone who is Disney dreaming or has a Prince or Princess at home wishing upon a star! :) This weekend, Build-A-Bear Workshop® is celebrating the launch of its Disney Princess Bear and collection of enchanting costumes by hosting Princess Weekend in stores throughout North America. Check with your local Build-A-Bear Workshop to see if the event is coming to a store near you! Guests will be given the royal treatment with paper crowns and jewel stickers to decorate in their own special way. After some Prince & Princess lessons, guests will be able to create magical memories with the new Disney Princess bear for around $23 (pictured below) featuring a sparkling crown and paw depicting beloved Disney Princess characters and majestic crowns. Remember, your princes and princesses are welcome and encouraged to dress up too! Let me know in comments what you think of the new line or post a picture of your new bear to the Picturing Disney Facebook page!